The group of DC blogging foodies brought together for a brunch at the newly renovated North Bethesda Marriott (across from the White Flint metro) all know their food – and that’s an understatement. I was able to have a chat about the details of egg-poaching, so you know I was in my realm! 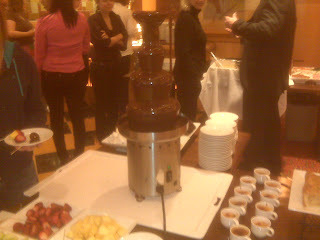 Anyway, we were given free reign over the normally-$25 brunch buffet at The Meritage, the hotel's flagship restaurant. It was, as you might imagine, like kids in a candy shop. And I think this knowledgeable crew was pretty pleased. Well overall, at the very least, this kid liked his candy. 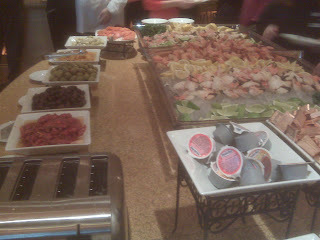 Divided into a number of stations, the brunch was generous and inclusive of OJ, coffee and, get this, mimosas! The $25 would have been well spent there. The service was very attentive, but I'll write that off since we were VIPs of sorts. The salad station was visually appealing with many toppings, but the toppings were pretty run-of-the-mill so I gladly skipped everything but a bit of their Caprese salad. Despite the basil being a little lacking, it was a very nice Caprese. It was in ball form as opposed to sliced. I prefer fresh mozzarella sliced, but it was still a very nice salad. Next I moved to hot entrees in chauffeurs. Elegant and appealing, all of the food looked terrific, but I'm not one for salmon filets or chicken breasts, or chicken noodle soup at brunch. 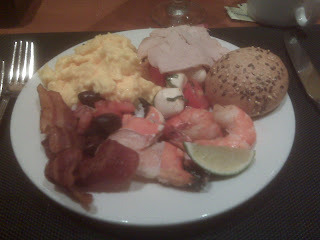 I stuck to brunch-fare and helped myself to some gorgeous, moist scrambled eggs and some thick cut bacon. Both were perfect and I have high standards, being an eggist. For being in a chauffeur and not being dried out, I was stunned and thrilled. Looking back I probably would have been content with just the eggs and bacon, but that is not an indictment of the other food. Next was the carving station, where I procured a slice of rare roast beef and roasted turkey breast. The turkey unfortunately was quite dry, but the breast at the carving station had looked moist and very appealing so I could have gotten unlucky. The beef was perfect, juicy and incredibly flavorful. The chef was bringing a new one every 5-10 minutes, so this was as fresh and tasty as you can imagine. As I continued my graze, I bypassed all breads, bagels, danishes and potatoes, as they all looked much more tired than their carb-less counterparts. Some fresh bagels or bread would have been a welcome treat. I took a roll that was supposedly fresh-baked, but it was pretty hard so I skipped it. I also bypassed the omelet station since the line was long and I had my scrambleds, but all of the omelettes looked very hearty and appetizing, with many toppings to choose from. Perhaps the most impressive-looking aspects of the entire array was the one that really pulled on all my strings. There was a huge ice display covered in a multitude of cocktail shrimp and lobster claws. Surrounding them was a myriad of little antipasti including olives, sundried tomatoes, artichokes, smoked salmon, red onion, tomato, capers and the like. I could eat this stuff all day and be happy as a clam – or lobster. The pre-cracked claws were a little tough to eat, but they were tasty and that's what I care about. This cold portion of the brunch is what excited me most and filled the center of my plate. I love freshness with my food, especially in the morning (which is why I skipped the waffles for example), so a little kalamata, red onion and diced tomato in a makeshift salad is something I really want in a protein-filled brunch. So after a hearty plate of the best foodie selections from what was a pretty darn impressive brunch, and two excellent mimosas (very bubbly), I just HAD to hit up the dessert table. Complete with chocolate fountain and dippers, little crème brulees and a variety of cake slices and petit fours, I had no trouble balancing the meal with a little sweet. I had a chocolate covered Rice Krispie treat and fresh pound cake chunk, a mini crème brulee and a very moist classic petit fore. All were good, but none were legendary. But hey, it is brunch after all. A plate of tasty, fresh and high quality food is what I want, and this hit all those spots. If you’re in Bethesda, I would definitely recommend stopping by the Bethesda North Marriott Hotel for a foodie-blogger-worthy brunch. No egg-poaching knowledge required.